These Haunted Houses Are Voted "THE BEST HAUNTED HOUSES" in the U.S.! Each year, the top 31 haunted houses in the U.S. will be posted here after the Halloween season has ended and all votes are tallied. 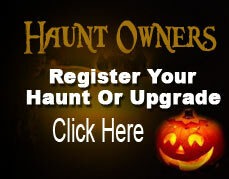 Be sure to get your vote counted by voting for your favorite haunted house today!